Recently, a large U.S. bank was found to have created unauthorized accounts; a similar bank closed one of my accounts, but doesn’t know why it happened. More than a decade ago, I opened a safety deposit box at a local bank (a very large U.S. bank that all U.S. residents would have heard of). 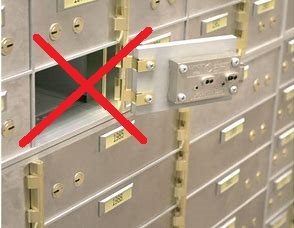 This wasn’t my regular bank, as my bank didn’t have such boxes; I only went to this other bank when I needed to access my safety deposit box, which was not often. Every year, I received a bill to pay for my box. I paid it. Several years went by, and then I remembered that I haven’t received a bill from that bank lately. I thought I should look into it. But then I’d forget, and another couple years went by. And then I remembered that I never receive a bill for my safety deposit box anymore, and that I never looked into it. One Friday, I was driving by THAT bank, so I stopped, and went it. I explained my concern, so they entered my name and address in their system, and found no record of my account. I explained that I had worked at the headquarters of this bank, in the IT department, several years ago–they need to look harder. The bank then called their customer support hotline and opened a ticket. They’d look into it. The banker said that she’d see me on Monday, and hoped to have an answer. When I arrived at the bank on Monday afternoon, I didn’t have my key, as I couldn’t find it. I told the banker this, and she looked like she was starting to think that I was making this all up. No key, no account record. Since she had not heard anything from customer support, she called again. After 30 minutes of being transferred to various departments, the bank said that they located my account, but didn’t know what the box number was, and they had no record of it being closed–but it was definitely closed. I told the banker that I was an auditor, and that I thought they should have a copy of the account closing form with my signature on it, explaining why the account was closed. She agreed, but said that no such record could be located. I asked her if she thought that was a problem, and she said, “Yes.” She said that customer support said that it definitely wasn’t drilled (when boxes are ‘abandoned’ and they cannot locate the client, or the client loses the key, they drill the lock and open the box). She said that ‘not being drilled’ indicated that the account was closed, normally. The problem was, I didn’t remember closing the account, and the bank couldn’t prove I closed it. No, I wasn’t. That was the problem. I just didn’t remember. Okay, you’re wondering how anyone, especially an auditor, forgets something of that importance. I’m not sure either, but I did. Fortunately, I never put much in my deposit box. A couple receipts for some real expensive items, and some DVDs containing a copy of our family pictures. So in this case, it really didn’t matter. But if the bank can’t produce my closing form, how many other closing forms has the bank misplaced? How many of those accounts were closed legitimately? The banker assured me that she would raise this issue at headquarters to ensure it would never happen again. Where have I heard that line before? I’m not sure, but I think I probably closed the account myself. I always kept my key in a particular spot, and it wasn’t there. That’s the most likely scenario. If someone else DID close my account, they didn’t get much. Later, when I was relating the story to a fellow auditor who is a Certified Fraud Examiner, he said that the bank should have a record of my account closing form. He was not comfortable with the bank’s explanation and reasoning, and said I should not have accepted it. Then he asked me whether I asked a specific question of the banker. Can you guess what it is? After he told me, it seemed like a pretty obvious question, one that I should have thought of. Give up? I should have asked to banker if the bank had the keys to my box. If so, that would be a better indication that the box was not drilled, and that I may have closed the account (if the box had been drilled, keys with a different cut would have been created to match the new lock). However, recall that the bank couldn’t tell me what box number I had, so in my case, it would not have helped. Yes, I am familiar with unclaimed property etc. I did not move. Also, the same bank has my mortgage, so they should’ve been able to find me. I’m pretty sure this Incident was just an example of poor procedure and/or human error. The bank said that their documentation indicated the box was not drilled. Not the greatest evidence, I know. Simple, don’t have overly complex financial affairs and multiple Bank Accounts! You misinterpret. If you have complex affairs, you will require either a good Accountant, or be financially savvy.